Rosetta is internationally calling for new music, for our summer concert 2019 held in Kyoto, Japan. Beholders in museums or galleries are able to decide the duration they spend in front of their favorite painting or sculpture, to enjoy, to find different aspects from various angles. This is made possible because those visual art work have no time frame, except for the opening hour or period of the exhibition. How can this flexibility of public be adopted into musical concert? Musical work itself usually has a time frame of beginning and end. How can we deframe this tradition? Rosetta is internationally calling for work responding to those questions from composers, artists or anybody curious about our theme. Musical / sound work without fixed start or end, can be interrupted in the middle, and resumed in any timing. Musical / sound work with long or endless duration, and partial performance can be a complete form of the work. Music of any form, but without strict time frame.Selected work will be given 30 minutes for their performance. -if the piece has longer duration than 30 minutes, it would be performed partially. But the partial performance should be a complete form of the piece. *Tremolo / Picking technique must be clearly notated for mandolin. *Mandola Tenore is GDAE tuning, an octave lower than mandolin. *Internal technique for piano may be used, but should be suitable for left hand playing. *Prepared materials maybe available if it is easy to prepare AND also easy to remove. The music will be performed in a large open space, thus there will be no stage. Musicians will be placed in the center of the space. Audience will be free to walk around the space during the performance. The submitted work must not be previously performed or published. We welcome all style of notation. Traditional notation as well as Graphic, Video, Sound or any other media is accepted. The instruction should be written in either in English or Japanese. We only accept one work from one composer / artist. The selection will be made by 31 May 2019. The result will be announced on the website. The result also will be communicated to participants by email individually. 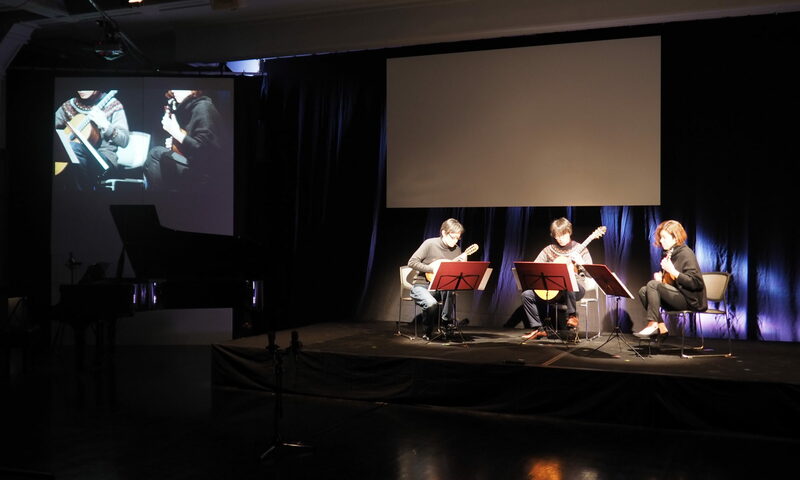 Approximately 2 works will be chosen to be performed at the concert, by the selection committee including performers of rosetta contemporary ensemble and composers who write commissioned work for the concert. You will find the submission form on the bottom of this page. your score PDF file (sib / mus / word files are not acceptable) of Max. 10MB. If you do not use traditional notation, you still need to submit PDF file of instruction for your work. The text must be written in Japanese or English. YouTube or Vimeo link to your Videos. please contact us from our contact form. All rights of the selected work will remain to composers, except for the performing right ONLY for the concert held in summer 2019, when the piece will be given the premier. There will be no cash prize. Rehearsal for composers reside outside of Japan will be done through recording correspondence or on web streaming. Composers are encouraged to visit the concert, however, composers must pay travel expenses themselves. Recording will be supplied to the composers. please upload your video to YouTube or Vimeo. For audio and graphics, please upload your files to google drive. I agree that the performance right of submitted piece will transfer to Rosetta for premiere performance in Japan. The right will immediately re-transfer to the composer after the premiere performance. *The agreement is only valid when the submitted piece is selected.